What Headphones is Michael Phelps Wearing at the 2012 Summer Olympics? 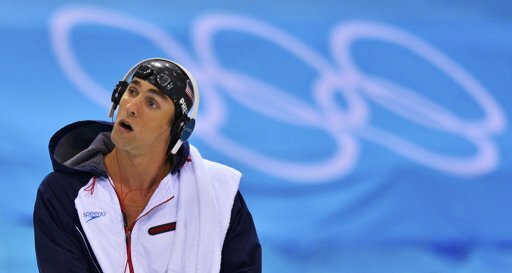 Michael Phelps wearing the “mysterious” Headphones-Summer Olympics 2012-Picture courtesy of Toby Melville of Reuters-Thank You for the picture! Update Alert (8/8/16): To see all the gear MP is Rockin’ including Michael Phelps headphones for the Rio 2016 Olympics, click here. So, All week-long or since the Olympics started, I’ve been watching Michael Phelps come out to swim wearing all sorts of different colored Headphones. And I maybe like you, “Wondered what kind of headphones are those?” I noticed that some days the metallic looking headbands were orange, then blue, red even Gold-or maybe those were the orange? Someday’s they matched his “attire” some days they didn’t. They did look nice and I totally dig custom anything. But I just could not read the logo on them on my TV. Thus I researched out the answer for ya’ll. These are pretty nice and I sure would dig a pair, but they aren’t what Michael Phelps wears prior to swimming. From an AdvertisingAge article on August 1, 2012, these were given to a bunch of Olympic Athletes in the village. 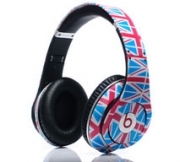 Michael Phelps has been seen wearing Beats by Dre headphones at the 2012 games and in the past (not these). And Jack Butland the goalkeeper for the English Soccer/football team has a pair, British Tennis player Lara Robson also has a pair and so does Great Britain’s Diver Tom Daley. These 3 were all seen wearing the ones pictured above. I doubt Michael wore this exact pair, but he probably has some red white and blue ones that he wears around the “combine”. Steve Aoki wearing Sol Republic Headphones. picture courtesy of lasvegasblog.com Thank You for the picture. Now, I’ll tell you!! the Sol Republic company will most likely make some big sales from this and other blogs. But, they sure didn’t make it easy to write this. 3 – 4 days of watching Michael Phelps and I couldn’t read the logo. And now I just tried to upload the really nice pictures of the Colorful headbands and some HOT models wearing the HP’s, but the last 4 pictures were rejected by WordPress due to security reasons. But, being a pretty detailed streetz reporter, I’ll finish off the story with more details on the Headphones. Or just google them or go to their website, if it hasn’t crashed by now. (From the influx of orders, not from irritated bloggers who can’t upload pictures..LOL) Just want to make that clear, I sure don’t want to get in any trouble over writing this just because I couldn’t share some pix. I Just thought they were pretty cool HP’s and I noticed a bunch of questions on my search engine on “What kind of Head phones is Michael Phelps wearing?”. The Sol Republic Tracks on ear headphones come in black and white and are available at $99.99 here. Now, Here’s the slick part that Michael Phelps has been taking advantage of, they have lots and lots of various interchangeable Headbands. Colors include: Electro Blue, House Pink, Dub Orange, Clitch Grey, and Red. BTW: If you were wondering? @DaraTorres let us know why Michael Phelps wears two swim caps. The under cap helps the outer cap stay on. And the outer cap is most important since its a slick dome cap with less drag, which gets you there quicker. So there you go! I’m enjoying these Summer Olympics, lots of fun to watch the action and the fashion. But, with all this Olympic Onslaught I havent had a chance to post the streetz fashion and fun from Lovefest and the #Lastbash. However you can check out the tune review from the Lovefest here. And I’m sure I’ll get the bash and fest info up soon. Hey! anyone know how to watch the Soccer/Football? I can’t seem to find that channel on my TV. And BTW, If you have a happening product you’d like seen on streetzblog.com, you can email me the pictures directly anytime. It would make writing the blogs easier and the quality would Rock also. Thanks. Posted on August 2, 2012, in Celebrities, Olympics, Streetwear and tagged Beats by Dre, fashion and fun at the 2012 Summer Olympics, fashions at the olympics, sol Headphones, summer olympics 2012, What kind of Headphones is Michael Phelps Wearing. Bookmark the permalink. 1 Comment.